With SonicBrite™ it's easy to keep your retainers, mouthguards, and dental appliances clean, disinfected, and smelling fresh! Works well for all types of dentures, too! The Sonic Brite Retainer Cleaning System is a safe yet powerful cleaner for all types of removable dental appliances such as: wire Hawley retainers and appliances, mouthguards, nightguards, bruxism appliances, and TMJ splints. (Note: it is not recommended for clear Essix retainers or Invisalign aligners, as it can sometimes turn their plastic cloudy). Don't be fooled by low price sellers on Amazon and eBay who carry expired old products -- our SonicBrite Kit is always factory fresh from the manufacturer! The cleaning powder is gentle enough to get all the thick white build-up off of your retainers and dental appliances, leaving them good as new; yet tough enough to clean even the most stubborn coffee and tea stains off of dentures or partials! It helps keep all types of dental appliances bright, clean, and fresh. It also disinfects. In independent laboratory tests, the SonicBrite system killed more than 99.9% of germs in one 15-minute use, including Staphylococcus Aureus and e. Coli. Click Here for more detailed information about how SonicBrite cleans even the most difficult icky buildup on your retainers. One heavy-duty portable sonic cleaning bath with built-in timer -- shuts off after 15 minutes (takes 4 AA batteries, not included). This powerful unit fits easily on your countertop -- it is 5 inches in diameter by 4 inches tall. One 7-ounce (200g) bottle of professional strength cleaning crystals powder (enough for 64 cleanings). Full instructions. (Please note: a measuring spoon is no longer included). Place 3/4 cup warm (not hot) water into the cup of the SonicBrite™ cleaning unit. The cup of the Sonic Brite cleaning unit is removable for extra portability. Add 1/2 teaspoon of SonicBrite cleaning powder. Insert your dental appliance. Close the cover and turn the unit on. It is automatically timed to run for 15 minutes. Do not let your appliance soak longer than 15 minutes. Rinse your dental appliance thoroughly with fresh water before using. Please note: the cleaning unit is sonic, not ultrasonic. Sonic Brite is not recommended for appliances containing gold. Do not soak appliances containing metal components for more than 15 minutes per cleaning. Not recommended for appliances containing metal solder. SonicBrite is not sold in local stores. Kills 99.9% of germs in one 15-minute use. You get one 7-ounce (200g) bottle of cleaning powder (enough for 64 cleanings), a sonic cleaner with a 15-minute shutoff, and full instructions. Takes 4 AA batteries, (not included). For best results, use it every day to prevent white plaque buildup. If your retainer already has white plaque buildup, soak it in SonicBrite 3 or 4 times to remove the plaque. Strong enough for dentures, yet gentle enough for all types of retainers. Will not turn retainers yellow. 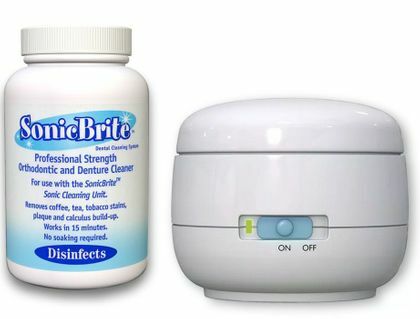 Yes, you can use the sonic cleaning bath from SonicBrite with other cleaners, such as Retainer Brite tablets. The manufacturer does not provide a list of ingredients, but if you are concerned about an allergy, please contact us. Sonic Brite is not recommended for: appliances containing gold, appliances containing metal solder, Invisalign aligners, or clear Essix retainers. Do not soak appliances containing metal components for more than15 minutes per cleaning. SonicBrite is a high-quality dental appliance cleaner which is strong enough for dentures, yet gentle enough for retainers. It is especially good at removing stubborn white plaque buildup after several uses. We really like the sonic cleaner that comes with the SonicBrite kit. It is well made and includes a 15-minute shutoff timer. When will SonicBrite be back in stock? The manufacturer is retooling and improving this product. We expect to have it back in stock by the end of the summer, or early Fall 2018. Does this product come with the spoon that is shown in the video? Thanks for asking! No, a spoon is no longer included with the SonicBrite Kit. The manufacturer decided not to put it in the kit about two years ago. You can use any measuring spoon to measure out the product. Do you use this everyday? Yes, if you want your retainers to remain free of bacteria and white plaque build up, you should use SonicBrite or another retainer cleaner every day. Does this product also whiten your aligners? There are no whitening agents in SonicBrite. It is a cleaner, not a whitener. Aligners are clear, so there is no need to whiten them. Hi will this remove yellowing on invisilign retainer? Yellowing on an Invisalign Retainer or any clear retainer is usually the result of plaque buildup due to improper cleaning. If you use SonicBrite 3 or 4 times in a row, it should remove the plaque buildup. If the yellowing is a result of staining from curry, mustard, or wine, no cleaner will remove them, as the plastic itself has become permanently stained. Will it be OK to leave your retainer soaking for longer than 15 or 20 minutes? We have found that if your retainer does not contain metal solder or gold, soaking longer than 15 to 20 minutes should be fine in most cases and should not harm your oral appliance, even if you leave it soaking overnight. (Most soaking solutions will dissolve metal solder and discolor gold after a period of time). If you're not sure whether your appliance contains metal solder, please ask your dentist or orthodontist. With that said, please be aware that the official manufacturer's instructions recommend that you do not soak your oral appliance longer than 15 to 20 minutes. When in doubt, we suggest that you defer to the manufacturer's instructions. My retainer was crusted over with gunk and it smelled bad. I used Sonicbrite to clean it, and after just a couple of cleanings my retainer was good as new. I've had this product for a couple of months and so far the cleaning machine is working just fine. I really like that it turns itself off after 15 minutes. I also like that the Sonicbrite cleaner is unscented, because I really don't like mint. So far, I'm very happy with this product. ConsI can't think of any cons. Works great for my retainers! I put them in the cleaner and go on doing what I need to do to get ready for work. Some commented that vibration was too much; I don't have that issue at all. I love this product! I have tried this once a day and even multiple times daily but my Invisalign still has a yellow glow after a few days. I Never put them back in without brushing and never eat or drink with them in. Not sure if there is anything else to try? A little disappointed! Merchant Response:It's very possible that the plastic of your aligner is stained. Once a stain seeps into the plastic, there is very little that can be done to make it clear again. You could try going to your orthodontist's office and have them put it into an ultrasonic cleaner (note: ULTRAsonic, not just sonic), to see if that helps. SonicBrite is an excellent product for removing most plaque buildup and surface stains on retainers and aligners. I used to think I could only bring my retainer in to my dentist or orthodontist office to get it fully cleaned and sanitized and remove all of the gross stuff that would accumulate no matter how much I scrubbed or soaked it in retainer brite tablets. This thing works like a charm! I ran my retainers through it 3 times to fully remove all of the built up junk and it came off! I just use it every morning after I wear it and it's been awesome! I am very pleased with the SonicBrite Retainer & Invisalign Cleaning Kit! There were some deep plaque stains on my retainer that were eliminated after a few rounds of cleaning. Some lingering stains seem to be breaking up well with continued cleaning and I hope to brush them off with a toothbrush soon! Very pleased! It cleans my retainer like has never been cleaned in years. I love this stuff such an awesome buy. I purchased this product based on reviews and I was not disappointed. My son uses orthodontic retainers and it did not matter how much we clean them, brush them or care of them it was never good enough to get rid of the smell. This product got rid of that issue on just 1 cycle! I strongly recommend this product you will be satisfied with the results. Very good system. Keeps the plaque off my bite guard and all the other yucky germs that transfer during the night. I recommend this to anyone who needs to clean a mouth appliance. Sonic Brite really works well-the cleaning unit is easy to work and maintain and with the rubber pads attached to the bottom protects the unit from too much movement while cleaning-the cleaning powder keeps the retainers clean and fresh smelling-Thanx for a great product ! 1st kit arrived with broken switch - wrote to Dentakit asking how to return for a replacement. Received answer immediately that there was no need to return the defective kit and they would send a new kit at no charge. New kit arrived in a couple days! No problems and really appreciated that it was an easy and quick process to get new cleaning kit. Really does a good job. Like the auto-off function also!